If you are following my campaign then you should know that the top 3 team will earn prizes for the contest. But just today my Fraternity and I are proud to announce that we have a mystery prize that will be awarded randomly. I hope you are as anxious as I am to find out what it is but it should be a good one! Pumpkin Carving Contest is tonight! The day has finally arrived! The Phi Kappa Psi Pumpkin Carving Contest is finally here. As of now we have 15 teams signed up too see who will claim the grand prize. The house is decorated, The sound system is running smoothly, and the food will arrive in about a few hours. I am very excited for tonight and I hope you all are too. After the event, we as a fraternity are having a costume party in the basement of the house, so you will still have a great time even if you do not receive a prize. Hope everyone has a great Halloween! Spooky Updates so far on the fundraiser! Hello viewers! this is Zack Hirsch here giving you an update on how the Phi Kappa Psi Pumpkin carving contest fundraiser is going so far. We so far have 14 eligible teams that have signed up which in my opinion is a pretty good number. We are branching out to local stores and buildings all around Indiana and are posting flyers with permission to attract more people. My fraternity brothers and I have taken the initiative to reach out to IUP sororities and sports team that might be interested in carving pumpkins for a great cause. The teams that have signed up so far have shared with me their desired costumes that they will wear the night of the fundraiser, and let me tell you, they are hilarious and frightening ! There is still 2 more days left to sign up for this spooky event. So if you or a friend are interested make sure to contact me personally at dgzx@iup.edu or, by my cell phone (484-999-1067). Let me know if you have any questions regarding the fundraiser. And don’t forget to follow the Phi Kappa Psi social media pages on Twitter, Facebook, and Instagram for more updates to follow! Hope to see everyone there! Halloween season is just around the corner! Hello Viewers! this is Zack Hirsch here. I just wanted to address a few things that might make you more comfortable or accustomed to supporting my campaign. Halloween season is just around the corner, and I could not be more excited then to start a pumpkin carving competition to raise money for the Boys and Girls Clubs Of America! We encourage everyone already attending this event to dress in the most silly or spooky costumes that they can find. But for those unsure or unaware of the fundraiser, our purpose is to have a great time and share a few laughs by dressing up and carving anything you want (appropriately) into a pumpkin to possibly win a prize. Anyone looking to support a great cause and is interested in dressing up and carving A pumpkin should definitely support/attend this event. One aspect that makes this campaign so cool is that the event takes place on Halloween night! What better way to celebrate a magnificent holiday then to support a great cause and carve pumpkins in costumes. Being that the event is sponsored by our fraternity, I strongly encourage everyone that regularly attends our philanthropy and social events to come and support one of the best fraternities at the Indiana University Of Pennsylvania. Halloween music will be blasting on our high tech speakers to set the mood for this amazing Halloween night. And what better way to be in a good mood then to get down to the Monster Mash! Inappropriate behavior and alcohol will be prohibited at the event. If you need to learn more about the event, you can personally email me at dgzx@iup.edu or look up the Phi Kappa Psi homepage on Twitter, Facebook, and Instagram. Looking forward to seeing everyone dressed up and ready to get their carve on! 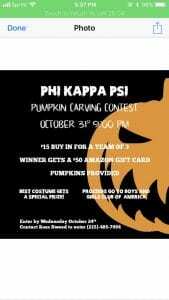 Phi Kappa Psi Pumpkin Carving Contest Fundraiser!! 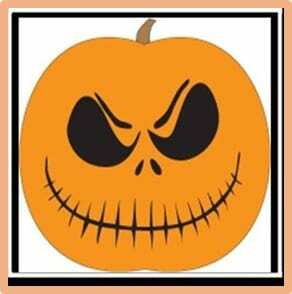 Phi Kappa Psi kicks-oﬀ it’s 1st Spooktacular Pumpkin Carving Contest Fundraiser! If you’re excited about hacking, slashing, and jabbing at something with a knife, please join us for our Pumpkin Carving Fundraiser! Proceeds will go to the Boys and Girls Club of America. Winner receives $50 Amazon Gift Card*!! Contestants may bring/use whatever accessories they like to dress up the pumpkins. $15.00 submitted for team of 3 people. All proceeds go to the Boys and Girls Club of America!